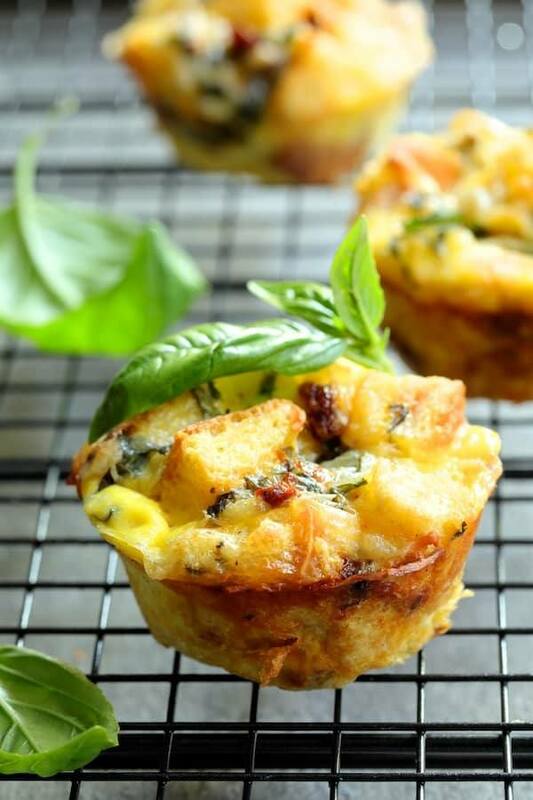 Enjoy the taste of summer for breakfast or brunch with these Muffin Pan Stratas with Basil and Sun-Dried Tomatoes! Preheat oven to 350 degrees. Coat a 12-muffin muffin pan with cooking spray. Combine cubed bread, sun-dried tomatoes, basil, cheese and salt and black pepper in a large bowl and toss to evenly distribute ingredients. Press even amounts of the mixture into each muffin cup. Whisk together eggs and milk or half-and-half. Season with salt and black pepper. Carefully pour into each muffin cup over the bread mixture. Bake for 20-25 minutes or until puffed, golden and set. Loosen stratas from sides of pan with a thin knife and serve immediately.